A capella group, Beautiful Mess, performs a song in support of the victims being honored at the vigil. 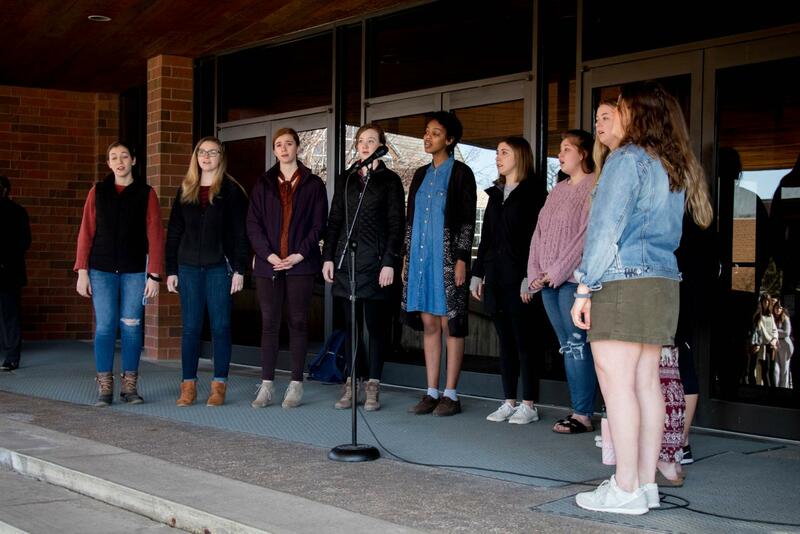 Interfaith in Action hosted a vigil on Thursday, March 21 at 10:15 a.m. on the front steps of the Center for Faith and Life in response to the shootings in Brazil and New Zealand, the Ethiopian plane crash, and the building collapse in Nigeria. 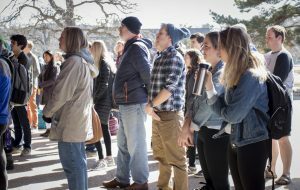 Students, faculty, and staff members volunteered to speak on the issues of the events and called the Luther community to action in a response to the impact of white supremacy, terrorism, and biased media coverage. A capella group Beautiful Mess sung at the beginning and end of the vigil while students passed around green ribbons that symbolized life, energy, renewal, and safety. College Pastor Mike Blair helped organize the gathering and said that the aim of the vigil was to make sure that under- reported stories are part of the narrative. Students, faculty and staff attend the vigil in solidarity. Blair also believes that people should be more aware of their actions that marginalize others and encouraged people to stand in solidarity with victims of tragedies. After the shootings at the two mosques in New Zealand, college Pastor Anne Edison-Albright led a prayer in chapel. Co-president of Interfaith in Action Liz Wiebke (‘19), helped put the vigil together. She said students gave their ideas to organize the vigil because they wanted to support the community. “The reason that we like to hold visible community gatherings, vigils, is to show support for our Luther students and our Luther community that are deeply connected to some of these tragic events or that maybe are not deeply connected but are still having a hard time dealing with what to do after there is so much tragedy inthe world,” Wiebke said. 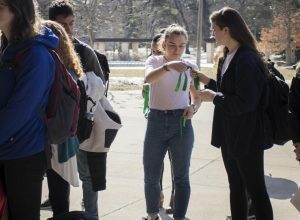 Green ribbons were passed around during the gathering for students to wear and display throughout the day. Harry Merz (‘20), from New Zealand said that the shootings in his country was based on hatred and Islamophobia aimed to divide. “It’s unfortunate that we are gathered here to recognize tragedy. In Christ Church New Zealand, we suffered a terrorist attack that killed 50 innocent Muslims as they prayed. We must be sure to remember the victims [who were] innocent, good people [that were] killed. It was an Islamophobic attack. It was an attack of hatred. It should never have happened, and no one in New Zealand thought this would ever happen there. It didn’t just happen out for nothing; this hatred builds up. We must tear down this hatred.” Merz said. Merz also encouraged attendees to welcome multiplicity and to stand with victims of hate crimes and other tragedies that affect communities globally. Anthony Perez Soto (‘20) who spoke at the vigil, said that people are connected in an international global community. “We are not a community where we do not express our solidarity with those who are around us even when the events do not impact us directly. We claim that we are an international and inclusive community but it is something we should aim to be on a daily basis, not only in this community, but also globally,” Perez Soto said. In her call to action, Ashalul Aden (‘20) shared a tweet, during the gathering, from the associated press that noted the victims of the Ethiopian plane crash were listed, but that the victims from African countries were left unmentioned. She also called out the news report that covered the New Zealand shooting and called mosque that was taking place, peaceful. Aden’s response showed how the media stereotypes Islamic mosques so that they can’t be inheritably peaceful. The only way that someone would think to consider it peaceful is if an outsider labeled it with that adjective. Aden asked the crowd to read, listen, or to watch the news and to be aware of who the news is talking about. She said that the adjectives that are being used to describe people and the people that are being left out are intentional. Blair also highlighted the difference in how the media reports in shootings depending on the ethnicity of the perpetrator. “It’s quick to move to the label of terrorism if the attack involves somebody that has any connection to Islam. Whereas, if it’s connected to white supremacy in some way, it’s almost always talked about as a lone wolf or an isolated incident. We’re much less likely to talk about a threat or a movement in relationship to white supremacy,” Blair said. Attendee, Meghan Anderson (‘20) said that one of the ways to prevent the news from becoming biased is to read critically and notice how the perspective of the news affects one’s point of view.